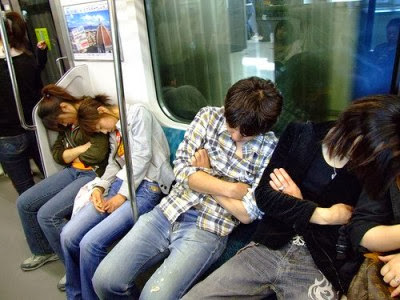 What and what not to do in Japan. 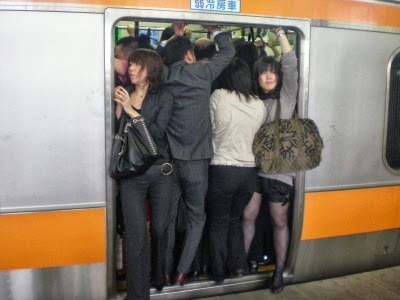 You might think you have no trouble boarding onto to any public trains in Japan. Nowadays, there are English sings at almost any train stations. So, just buy some ticket and go onto the station. Find your train and get on board. Yes, it is very easy as long as you are GAIJIN. Going all stations of the YAMANOTE line (loop) of Tokyo, Japan. You can hear English announcements. GAIJIN, the dictionary says the meaning is "foreigner". But real meaning for ordinal Japanese is "an alien who should be ignored and not be accepted to the society". 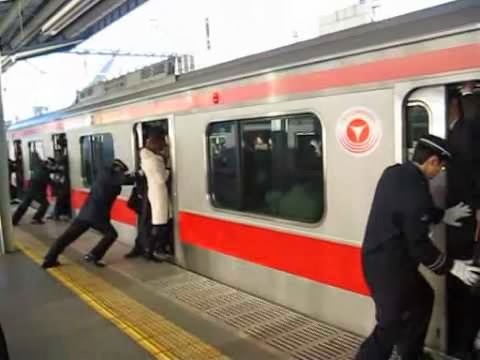 There are many published and unpublished rules to board the trains in Japan. If you ignore any of them, you can still get on board the trains. But Japanese people will take you as GAIJIN. 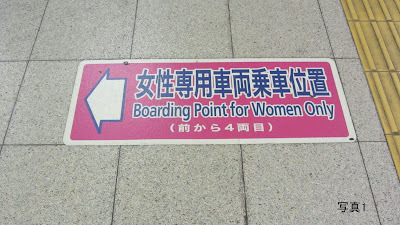 When I came back to Japan, I was surprised to find the public train system had the women only train cars. 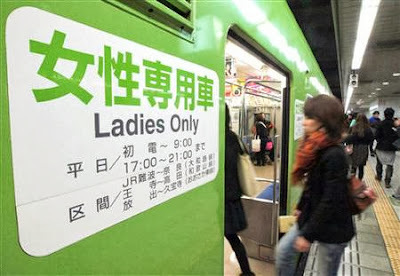 I immediately thought that the train cars were divided into Women and Men like a public toilet. I looked for Men's car, but there was no such thing. 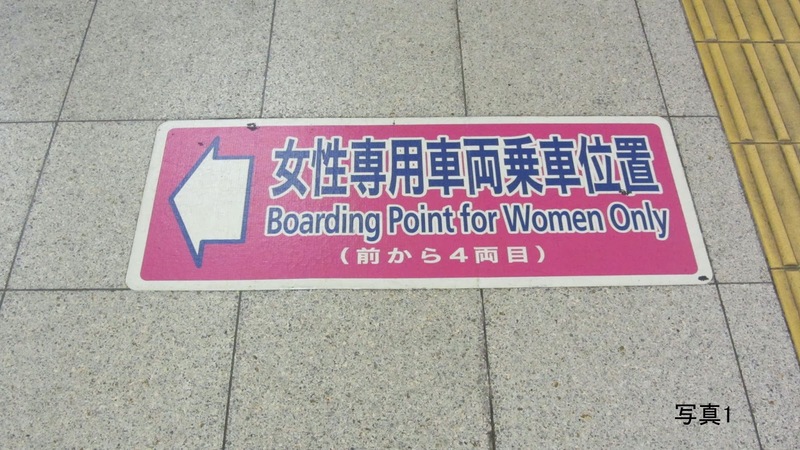 For more details, you can refer Wikipedia (English) "Women-only passenger car". This applies to big cities such as Tokyo and Osaka. The huge numbers of people get on the public transportation during the morning and evening, before and after 9 to 5. If you can slightly move the schedule, Do not get the trains during that time periods. There are the seats reserved for the passengers with special needs. The seats are usually clearly marked. The seat with the printed logos (right) is the priority seat. Non marked seat is ordinal seat. 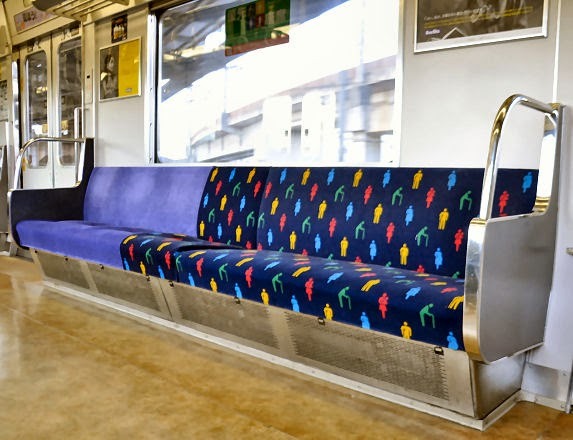 However, it is all right that everyone can sit down to both seats as long as available. Somehow, the reserved seat is the last seat filled. 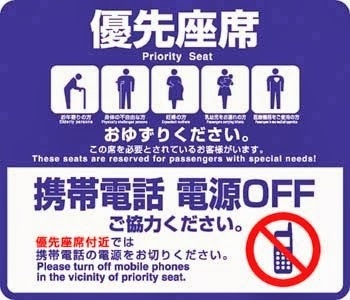 People dislike to sit the priority seat because they must be carefully check any special needed passengers at each stop. Also, the train master annoyances to turn off the switch for all electrical devices such as cell phones which may disturb the medical equipment used by the passenger if you stand/sit nearby the priority seat. Almost none of the passengers turn off the mobile devices. Many people were in the train. It was about 6 pm of weekday. I noticed no one speaking. Only a group of foreign tourists were talking. Of course, there is no such law that speaking in the train is prohibited. 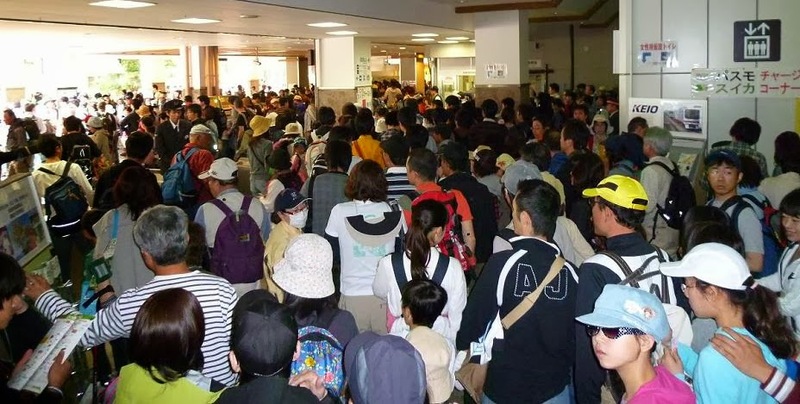 However, it seems one of important non-written rules for Japanese passengers. Japanese people dislike to hear other people talking on the phone. They even don't like hearing other people's phone ringing. If you carefully listen to above Tokyo train video, the train master keeps announcing to request not to talk and not to allow ringing. Be careful to use cell phones in the train. It is OK to email and watch your smart phone or listen to music. 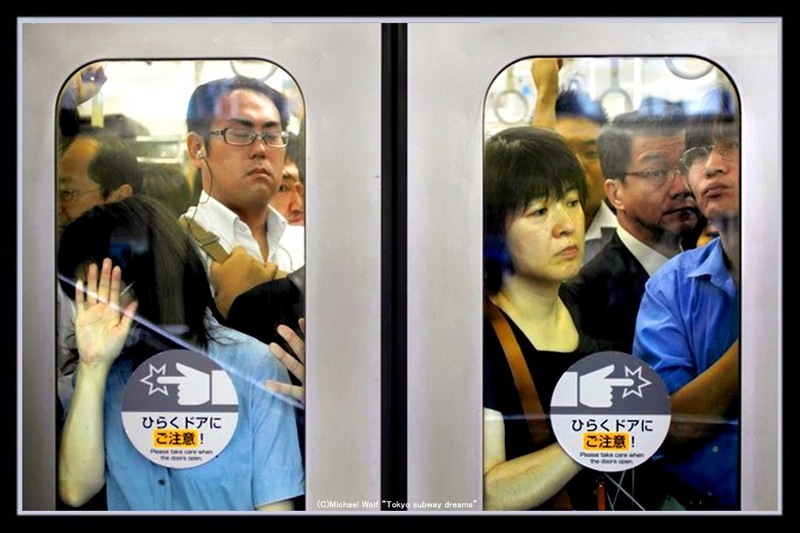 Since there are so many restrictions in the daily train riding, the commuters had only two choices in the train. The first choice is to watch, play and listen to the smartphone. 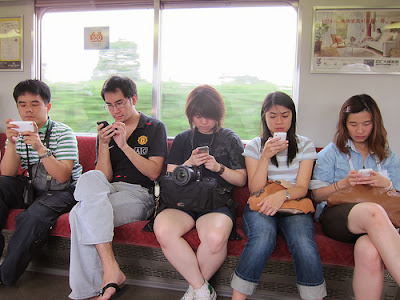 After introduction of smartphones, it was almost a bible like tool for everyday Japanese commuters. The second choice is to hibernate own body and wait for the train approaching the own destination station. After arrival of the destination station, many people still watch, play and listen to the smartphone although the station crowded with thousands of people rushing to home/office. As a result, there have had many accidents so that train stations keep announcing "Do not use smartphone in the station". But it is OK to use smartphone as phone in the station.